Spring and summer are the perfect times for outdoor parties but when mosquitoes arrive everyone heads indoors. No one likes itchy mosquito bites. Most of us consider mosquitoes just an annoying nuisance however mosquitoes are a vector for disease and transmit Heartworm in dogs. You should contact Metro Guard for mosquito control – whether you want summer long mosquito reduction or a one-time/event treatment. We have a program designed for you. Mosquitoes have 4 stages in their life cycle and can complete this cycle in as little as 10 days. 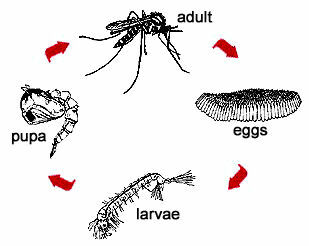 Factors such as weather, the species of mosquito and the availability of food all impact the life cycle. Egg Stage: Mosquito eggs are laid individually or in clusters in wet locations and individually in dry locations that are prone to flooding. Eggs laid in dry locations can stay dormant for months awaiting flooding or heavy rain. Larvae Stage: Mosquito eggs hatch into a larvae called wigglers usually less than a ½ inch in long in size. They have a small head, a center body section (thorax) that is enlarged, and a long cylindrical abdomen. The mosquito larvae live in water and feed on microscopic plants and organic debris in the water. Pupa Stage: Mosquito pupae spend their time at the water surface but do not move much. They do not feed during this stage. Adult Mosquito Stage: Adult mosquitoes are winged and can fly various distances. Some mosquitoes only travel 200 yards from breeding sites while some species travel longer distances (with the help of wind currents). Females mosquitoes feed on nectar and plant materials but most require a blood meal before they produce eggs. Female mosquitoes can produce up to 400 eggs. Adult mosquitoes typically live for about a week to 45 days in the summer and up to several months during the winter. Have questions? Contact Metro Guard and we’ll have the answers for you. Metro Guard inspects your yard for mosquito sites. We use 100% eco-friendly mosquito larvicide products in all areas that retain water such as bird baths, flower pots and drains. Our larvicide products do not lose their effectiveness even after they dry out. We use our unique application method to treat all mosquito resting sites in your yard. Our reminder service will contact you when it’s time for the next treatment but there is no obligation. Reduce standing water and look for sites that breed mosquitoes. 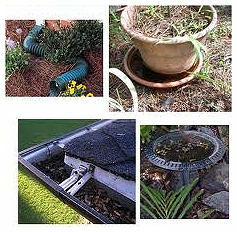 Bird baths, flower pots, low spots in the yard, upside down toys (frisbees or buckets), trash, and even barbeque grills. If you have a sprinkler system, make sure the sprinklers are not constantly creating an area that holds water in flower beds or low spots. Mosquitoes don’t need much water to breed. Check the area where your air conditioning condensation drains, there may be standing water near your home. Use mosquito repellent products containing DEET when you are outside. Make sure your pet is current on heartworm medications. Still seeing mosquitoes? Contact Metro Guard for a one time treatment. An adult mosquito can live as long as 5 months. It may take several months for a larva to devleop to the adult stage in cold water. Eggs of floodwater mosquitoes may remain dormant for several years, and hatch when they are covered with water. A mosquito’s wings beat from 300 to 600 times per second. Some people are more attractive to mosquitoes than others. It is not clear why, but probably has something to do with the 300 odd chemicals produced by the skin. In the interest of science, Arctic researchers uncovered their chests, arms, and legs and reported as many as 9,000 mosquito bites per person, per minute. At this rate, an unprotected human would lose one half of his or her blood supply in approximately 2 hours! That’s amazing! *Information retrieved from CDC Neato Mosquito Program.